This is a product-provided, sponsored conversation brought to you by Certain Dri®. All opinions, text and experiences are my own. Since we’re all friends here, I feel like I can be honest with you all. Don’t worry, it won’t be too TMI-worthy! I am always hot, always sweating and always have to have the fans on in my house. Most nights, my husband can usually be found under a comforter complaining how cold he is but I always tell him it’s easier for him to warm up than it is for me to cool down. In our van, the A/C is ALWAYS on, even in the winter (remember I’m in San Diego though so winter isn’t too cold). I’m just always fighting with being too hot & too sweaty and I don’t like it one bit. Being a sweaty hot mess just isn’t pretty and something I really hate. I’ve tried a lot of different deodorants and antiperspirants trying to help me with my issue. Sweat marks on my clothes just aren’t pretty at all! I’ve started using Certain Dri® Clinical Strength Anti-Perspirant because it has 72 hour sweat & odor protection so I can wear what I want without having to worry about embarrassing sweat marks. Now you can be confident too with the Certain Dri Protection System. The Certain Dri Protection System includes Certain Dri® Clinical Strength Anti-Perspirant Roll-On which now comes in a thicker, non-drip formula and is even more gentle on your skin, Certain Dri® Clinical Strength Anti-Perspirant Solid, which you apply sparingly at bedtime and Everyday Strength Certain Dri® AMTM, which you use in the morning for added freshness all day protection from sweat. You’ll be left feeling confident, fresh and dry. Go ahead & wear that favorite shirt and feel confident that you won’t have to hide those embarrassing sweat stains. Certain Dri® Clinical Strength Anti-Perspirant is the #1 doctor recommended antiperspirant for excessive perspiration and is the most effective antiperspirant that you can buy without a prescription. I’ve been to several blogging get togethers and lunches & every single time, I am always conscience of what I’m wearing, will it make me sweat even more than normal, will it show sweat stains and on & on. 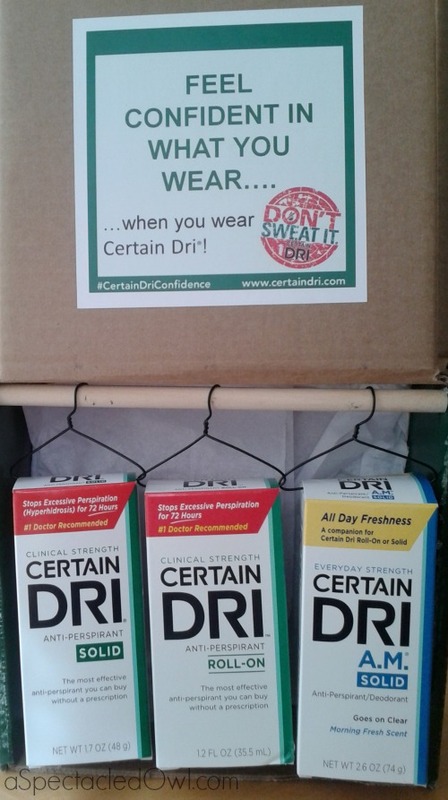 Using the Certain Dri® Clinical Strength Anti-Perspirant Solid instead of my usual solid gives me the confidence to wear whatever I want! 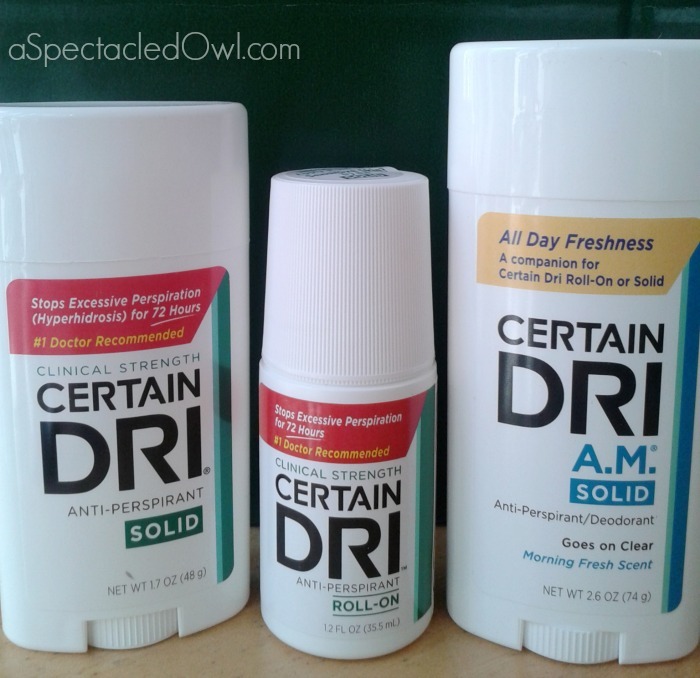 Certain Dri® Clinical Strength Anti-Perspirant products can be found in mass market retailers nationwide including Walmart, Rite Aid, CVS, Target, Duane Reade, as well as online retailers and at www.certaindri.com. You can enter the Certain Dri Closet Full of Confidence Giveaway over on Certain Dri’s Facebook page. One winner will be chosen to win a $1000 gift card to EasyClosets so they can put it towards a custom designed closet to hang all of their new clothes in, now that they’ll be shopping and confident with Certain Dri. Winner will be chosen on 6/26/2014 (around 12:30 P.M. EST). Winner will also receive Certain Dri® Clinical Strength Roll-On, Certain Dri® Clinical Strength Solid and Everyday Strength Certain Dri AMTM. This is a sponsored conversation written by me on behalf of CERTAIN DRI®. The opinions and text are all mine.